Hi everybody and welcome to Mondays & Memories of My Mom! This is a special blog I started last year to carry on my mom’s legacy. 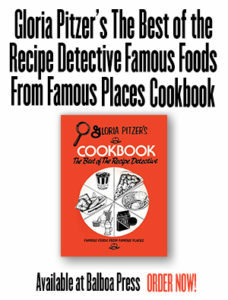 I’m Laura Emerich and my mom is Gloria Pitzer; also known as (aka) the one-and-only, ORIGINAL “Secret Recipe Detective”! That’s the name or title bestowed on Mom in the 1970’s era by her many radio talk-show friends and fans, because she could sleuth out the secrets of the food and restaurant industries like Sherlock Holmes (who happened to be one of Mom’s favorite, fictional book characters), determining how their dishes could be made at home with a minimum amount of cost, effort and ingredients. 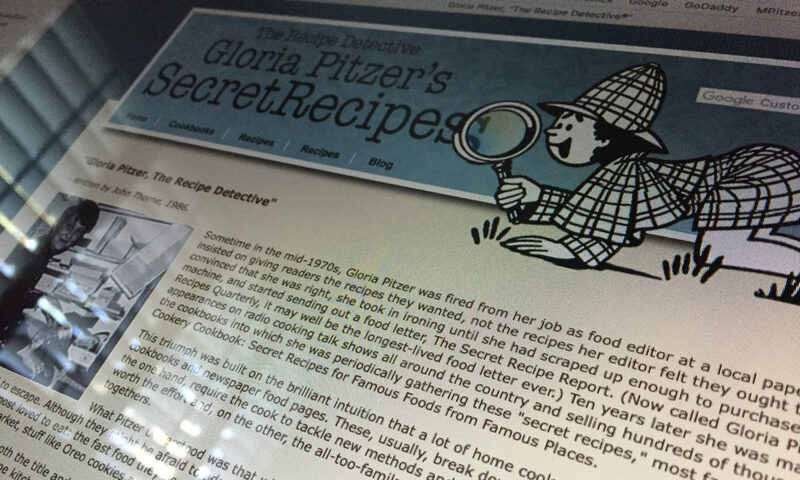 This week, I am continuing with “Part 3” of my 4-part, special series, “Mom’s Story – How Secret Recipes Began”, sharing with you some of Mom’s own memories of how she came to be “The Secret Recipe Detective”, her trademarked name. This particular series is based on excerpts from Mom’s story, in her own words, as seen on pages 292-297 in her last cookbook, Gloria Pitzer’s Cookbook – The Best of the Recipe Detective, published by Balboa Press (January 2018, 1st Printing) – a re-write by me, Laura Emerich, of her famous, self-published book, “Gloria Pitzer’s Better Cookery Cookbook” (May 1983, 3rd Printing). IT WAS THE WORST POSSIBLE TIME to launch a new business. The unemployment rate was terribly high. There was a newsprint paper shortage. There was a gasoline shortage. But, I couldn’t pass up the opportunity to at least try to have my own publication. It was something I had always wanted to do. I couldn’t tell Paul. I knew that! He would have been far too practical to have approved of my starting my own paper, so I enlisted the help of our children. I was taking in ironing at the time [1973-ish], at $5 a basket, and sometimes earned as much as $50 a week. The money was supposed to supplement Paul’s paycheck, which – as soon as we found could make ends meet – we discovered somebody had moved the ends. So, I took what money I could from the ironing earnings and bought a mimeograph. I kept it in a big box in the utility room under my sewing table. Paul would hardly pay attention to what I wanted him to think was only sewing paraphernalia. For 9 months , I mimeographed, assembled and mailed out about 100 copies a month of my “newsletter”. Bill and Mike helped assemble it and Debbie help me test the recipes and address the copies. I don’t know how we ever kept it from Paul for that long, but I couldn’t tell him what I was doing until I could assure him that I could make a profit. All I was doing was breaking even. Mom had a lot of creative gifts and writing was probably on the top of the list. She had a way with words that made me smile and laugh, as well as make me think, “Hmmm? 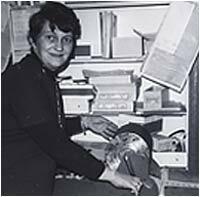 !” Her newsletters and books were full of “Food for Thought”, jokes, meditation, inspiration, historic information and so much more than just recipes. It certainly set her products apart from all the rest on the market at that time. She was largely influenced by Carol Duvall and her crafting newsletter, as well as, by Elsie Masterson and her “Blueberry Hill Cookbook” (1959). Then, Dennis Wholley, at Channel 7 in Detroit, called and said somebody had sent him a copy of my newsletter. He was tickled with the crazy names I gave the recipes and the home-spun format. He wanted the entire family to be his guests on his “A.M. Detroit” show on November 14th – which was also our Laura’s birthday. I couldn’t keep it from Paul any longer, because I couldn’t pass up an opportunity to promote the paper on a popular local television show. He took it quite well, considering the state of shock he must have been in at my announcement. But, we took all 5 of the kids with us across town, in a blizzard yet, with Laura having a bout of car-sickness during the hour’s drive there. And, during that experience, we met Coleman Young, the recently elected mayor of Detroit, who was also a guest on the show. All of Pearl Beach must have been tuned into “A.M. Detroit” that morning, with half of the population gathered at the Pearl Beach post office, watching the portable set there. 1974 – Paul & Gloria Pitzer going over orders at their dining room table in Algonac. It brought us many new orders for our newsletter, and it wasn’t long before CKLW’s Bob Heinz asked us to appear on his show on New Year’s Day. We, again, took the family over to Windsor, Ontario – across the Detroit River – for another exciting experience and hundreds of letters that followed, wanting to subscribe to the newsletter. By that time, Paul was giving me every evening of his time when he came home from his own job at the sign company, plus all the weekends just to fill the orders. Stay tuned, next week, for the final part of this 4-part series about Mom’s story – how she became the famous “Secret Recipe Detective” – in her own words, as she describes how Dad retired early, from the sign company, to help Mom full-time; and about her Arthur Treacher Fish challenge! I can say this, as one of the official taste-testers in the challenges that she endeavored from her radio listeners, “BEST job ever!” Even the “duds” (the ones that didn’t quite imitate the taste she was trying to achieve) were great! 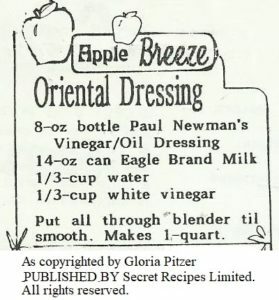 Note: this particular dressing recipe was not included in Mom’s last cookbook, “Gloria Pitzer’s Cookbook – The Best of the Recipe Detective”, published by Balboa Press (January 2018, 1st Printing) – a re-write by me, Laura Emerich, of her famous, self-published book, “Gloria Pitzer’s Better Cookery Cookbook” (May 1983, 3rd Printing). However, many other wonderful salads and dressings dishes, as well as wonderful morsels of “Food for Thought”, preparation tips and humorous antidotes can be found in the “Salads & Salad Dressings” chapter or section of this book on pages 26-48. Enjoy!